Note: additional photos can be found in this article’s photo album. Classifying corals based upon light requirements is certainly not taxonomic. As a trained cladisian I much prefer parsimonious clades. However, in terms of captive husbandry, lighting requirement classification is of great use. Popular (and very well written) books on coral husbandry currently include Aquarium Corals (Borneman 2001) and Corals (Sprung 1999). These two books are a necessity for marine hobbyists. Of course both books provide general lighting requirement information for nearly all common aquarium corals. 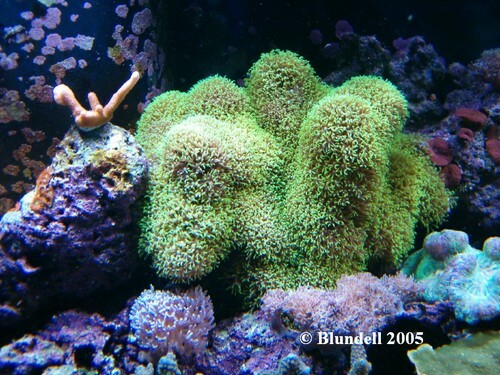 In 1999 Julian Sprung published his fantastic book on corals. In that publication Sprung uses a bar graph system to add values to the lighting needs of corals. These scales may be narrow or wide as needed and covers a range from 0 (the lowest) to 10 (the highest). The range does not describe what those numbers correlate with in terms of lumens, watts, photosynthetically active radiation (PAR), or bulbs. And how could they? In the authors’ opinion the scale formed by Sprung is ideal. We personally find it very disheartening to see the scale unused in common aquarium conversations. Instead, what has unfortunately happened is a growth in popularity of the terms low, med, high. Experienced aquarists agree that while corals naturally adapt to varying lighting situations, certain guidelines and levels are required for differing corals. A nominative scale is currently used in the aquarium hobby as low light, medium light, and high light. For corals with a wider range of light tolerance terms are used such as low to medium or medium to very high levels of light. What I am proposing here is a new classification system to replace the old terms. The scale is based upon the experiences of hobbyists that I have compiled into my classification chart. The idea here is to incorporate a more accurate lighting measurement with familiar terminology. 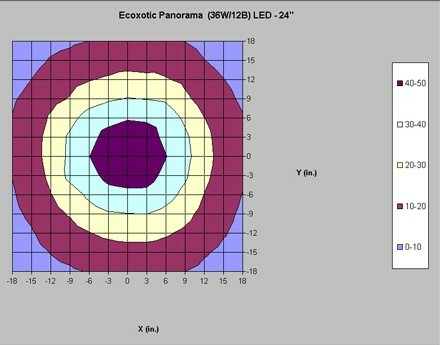 For this reason we are using Sprung’s breakdown of lighting ranges and correlating them with measurable units. For this proposed scale we are using PAR levels as our standard (pros and cons listed below in the side text section). Now comparing that to what I have found (conversing with fellow aquarists) to be light levels measured in PAR (µmol·m²·sec). These are measured values in home aquariums with ranges formed by the recommendations of the tank owners. And finally comparing average PAR (µmol·m²·sec) values with common terms. Wait a minute… is it really that simple? Does the scale of 0-10 really match up with a scale of 0-1000? Surprisingly yes? While I feel a bit rash in making that conclusion I am going to say it anyway. With the review of colleagues this article has been 6 months in the making. After that much time it still appears that this is indeed the case. Based upon this the author acknowledges that the use of common terms (while not as precise as actual measurements) is completely acceptable and fitting for the aquarium hobby. There is one major item of importance here. While this scale does represent common perception in the hobby, it is still quite likely that the perception is wrong. One counter point to this article is the current work of Dana Riddle. 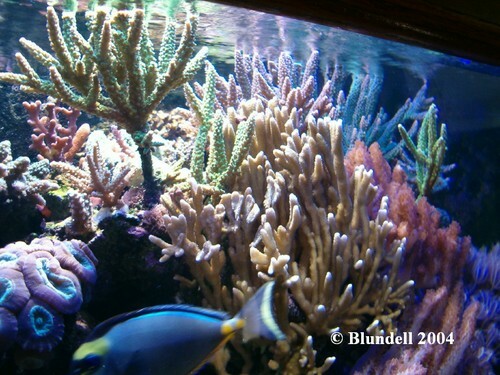 Riddle’s studies show that hobbyist may be frequently (if not always) over illuminating their aquariums to begin with (Riddle, unpublished at the time of this article submission). The scale presented here may need to be altered (significantly?) in the future; but for now this scale represents the terminology in our hobby today. Nevertheless, lighting at least for the foreseeable future will be continuously debated. This article is dedicated to Julian Sprung. Simply put – he is a great guy and I appreciate his friendship. Thanks Julian. Adam Blundell M.S. works in Marine Ecology, and in Pathology for the University of Utah. He is also Director of The Aquatic & Terrestrial Research Team, a group which utilizes research projects to bring together hobbyists and scientists. His vision is to see this type of collaboration lead to further advancements in aquarium husbandry. While not in the lab he is a member of one of the Nation’s largest hobbyist clubs, the Wasatch Marine Aquarium Society (www.utahreefs.com). Adam has earned a BS in Marine Biology and an MS in the Natural Resource and Health fields. Adam can be found at adamblundell@hotmail.com. 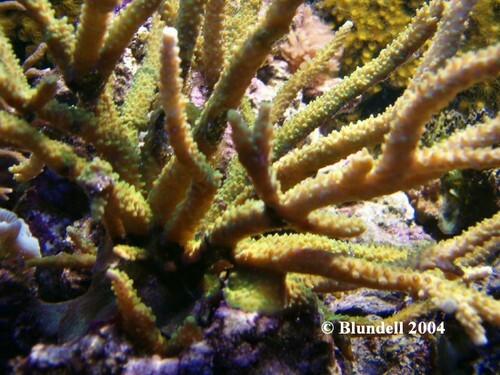 Borneman, E.H., (2001) “Aquarium Corals selection, husbandry, and natural history”, T.F.H. Publications. Neptune City, NJ, USA. Riddle, D., (2005) Personal communication, and possible future publication. Sprung, J., (1999) “Corals: a quick reference guide”, Ricordea Publishing. Miami, FL, USA.